In the hustle and bustle of everyday life, how do we, as parents, honor the spirituality of our children? As we shuttle between school, soccer practice, piano lessons, ballet lessons, birthday parties, and doctors' appointments, how do we find the time to encourage our children, through the ups and downs of growing up, to turn to God for guidance? In 10 Principles for Spiritual Parenting, Mimi Doe and Marsha Walch open our eyes to the spontaneous, creative, freethinking joy that characterizes a child's innate spirituality. In ten easy-to-follow chapters containing exercises and practical suggestions, the authors point out that opportunities to express spirituality are abundant in our routine life. Talking at dinner, lighting candles, performing daily chores--all of these events have the potential to be sacred moments. Contemporary parents face unique challenges: In our media-saturated culture, children are continually exposed to violence, cynicism, and a confusing code of ethics. By offering concrete ways to help children develop positive values, Mimi Doe and Marsha Walch support parents' efforts to counteract negative messages. 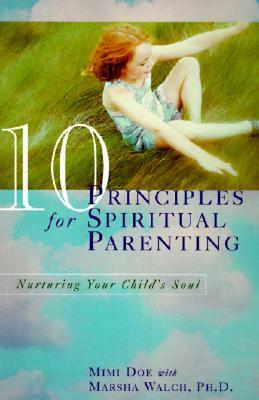 10 Principles for Spiritual Parenting is an invaluable guide for parents who yearn to help their children nurture a rich spirituality of their own.